No, this is not the most complicated Venn diagram ever devised. This is, in fact, a collection of silver colored steel frames in various shapes, which you can use to frame your stained glass piece. Your creation will not only have a smooth outer edge, but also will have much more stability and rigidity. 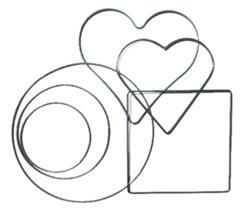 The things in this section are mostly metal and glass components, which are incorporated into jewelry items. Findings are the structure upon which ornamentation is glued, soldered or fused. The ornamentation can be fused glass, gems, beads, insects, pebbles -- whatever items you deem "ornamental," and are lightweight enough to do the job. Findings include jump rings, ear wires, tie bars, and bails, to name a few. 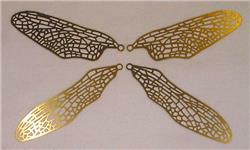 Dragonfly wing filigree in two sizes, for use in lampshades, suncatchers, or your veryown creations. Also poppy filigree especially for Tiffany style lampshades. Solid Oak frames for stained glass panels. After equipping one of these frames with hooks for hanging, you will be able to cause a mild sensation by displaying your favorite stained glass panel in front of a window or other light source. You can use brass rods and tubing make hinges. One method employs two tubes of different diameters, the other uses a brass rod instead of the inner tubing. These rods and tubes have myriad other uses as well, limited only by your imagination.